While space is lacking to discuss all of the excellent research published by BMC Evolutionary Biology in 2015, here we look back at the 10 articles (in chronological order) which attracted the most attention from our readers over the last 12 months. Along with their long arms, the characteristic we most associate with gibbons are their loud cries booming across the forest. Yet this research showed us that quiet calls are just as vital in gibbon communication. 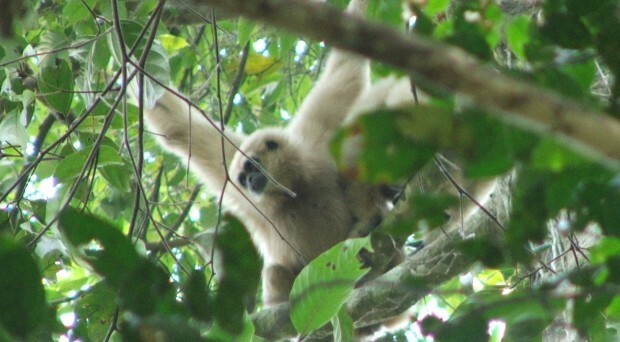 Researchers measured the low frequency “hoo” calls of the white-handed gibbon. While to untrained human ears these hoos all sound the same, acoustic analysis showed that they varied significantly depending on context; e.g. the hoos made in response to the presence of raptor predators are different from the hoos made in response to a leopard. This strongly suggests that the gibbons are using these quiet calls to communicate important information to other members of their group. Lead author Esther Clarke discussed the work on our blog and on BBC radio. Over the last decade, the advent of molecular dating has resulted in a minor revolution in the field of phylogenetics, with an explosion of studies utilising time-calibrated trees of the evolutionary relationships among species. Inevitably though, such phylogenetic models rely on a number of assumptions. One such is the branching process prior, or ‘tree shape’ prior, which effectively sets an a priori limit on how evolutionary trees can ‘grow’ in phylogenetic models. Using the iconic cycads as a model, Fabien Condamine and co-authors showed that the choice of branching process prior can have a drastic impact on our understanding of evolutionary radiations. They stress the importance of researchers carefully selecting the model they use for dating analyses, especially for ancient groups like the cycads. A cautionary tale, and one that clearly caught the attention of the phylogenetics community. A bad back is one of the more common human afflictions. Could the reason behind back pain be that sufferer’s spines are ill-adapted to walking on two feet? Not a new idea, but one provided further support by this study. Researchers used morphometric techniques to compare the vertebrae of both healthy humans and people suffering with Schmorl’s nodes (bony indicators of disc herniation), with vertebrae of orang-utans and chimps. The vertebrae of healthy humans were clearly distinguishable from those of our primate relatives, but those of Schmorl’s node sufferers were not. This supports the idea that disc herniation is more likely to affect people whose spines are closer to the ancestral end of the natural variation in human spinal shape. Or, to put it less subtly, your bad back may be because your spine is too much like that of a chimp’s. The evolutionary origins of snakes have long inspired considerable speculation and controversy. In May, these debates advanced with the presentation of the most complete picture of early snake evolution to date. Incorporating recently discovered fossils, new information on the anatomy of stem snakes and time calibrated phylogenies, the authors estimated that snakes first appeared 128 million years ago. Their findings also suggest that the original snakes were nocturnal, land based predators, with tiny hindlimbs. Lead authors Daniel Field and Allison Hsiang discussed their work in more detail on our blog. A surprising finding from Patrick Phillip’s lab at the University of Oregon: females of the nematode worm C.remanei mated with males originally collected from New York have a greater reduction in lifespan than those mated with males from Ohio or Germany. Why are New York males taking such a toll on their mates? The answer appears to be their aggressive sperm. In mating experiments, New York males out-competed their Ohio and German counterparts, displacing their sperm from females they had previously mated with. Presumably a side effect of this hyper competitive sperm is the detrimental effects on females. New York males seem to be bad mates, but excellent at fathering offspring. Phillip’s lab then teamed up with Micheal Palopoli’s group at Bowdoin College to test these ideas experimentally in C.elegans. They genetically manipulated the worms to convert the natural mating system of C.elegans – self mating hermaphrodites with very rare males – into a C.remanei like male-female mating system. Some lines were then bred with high levels of male competition, others lines bred in conditions where males had no direct competition for mates. Males in the high-competition lines evolved larger sperm which out-competed the smaller sperm of males from the non-competitive lines. Moreover, females mating with the high-competition males had shorter lifespans than those mating with the non-competitive males. Just as in the natural C.remanei populations then, higher competition for mates improves the competitive ability of male’s sperm, but at the expense of a greater cost to mating for females. It has long been known that many spiders can travel long distances through the air by ‘ballooning’, using their silk as a parachute to catch the wind. Through this behaviour these spiders are capable of dispersing considerable distances. However, it had always been assumed that should a ballooning spider land on a body of water it would meet a watery grave. Not necessarily so, found this study; some spiders are in fact capable sailors. By using their bodies as ‘sails’ and their silk as an ‘anchor’, otherwise land dwelling spiders can happily sail across water. We discussed this work in more detail on our blog in July. Adaptive radiations are one of the most important concepts in evolutionary biology. On encountering a new ecological opportunity, a single species can rapidly diversify into a multitude of new species, each adapting to a different niche. A classic example are Darwin’s finches on the Galapagos Islands, where a single ancestor evolved into many new species, each with beaks adapted to the prevalent food source on the different islands. Daniel Pincheira-Donoso and colleagues at the University of Lincoln studied the adaptive radiation of the South American lizard genus Liolaemus, remarkable for both number of species and the range of environments they can be found in. They suggest that the evolution of this group challenges our idea of what a ‘typical’ adaptive radiation looks like. First, while we tend to associate adaptive radiations with the new opportunities presented by previously un-colonised islands, Liolaemus lizards demonstrate they can occur on continents. In this case, it is the repeated eruptions of the Andes mountains that has created the new ecological niches encouraging the radiation of new lizard species. Secondly, the research shows that adaptive radiations do not have to be defined by an early burst of diversification, as one ancestral species adapts to multiple new niches. Instead for Liolaemus lizards adaptive radiation has proceeded for over 25 million years through constant pulses of speciation, driven by the periodic uplifts of the Andes. In September, this paper described the oldest sea scorpion (or eurypterid) fossil yet found, dating back some 450 million years. While many sea scorpions found in the fossil record were small and innocuous, this one was a large and fearsome predator. While undoubtedly visions of monstrous predators scouring the ancient seas for their prey were a significant reason for the popularity of this paper, it is also of considerable interest for deeper scientific reasons. Dave Marshall nicely outlined the importance of this fossil find for our understanding of animal evolution in his guest blog. In October, researchers at the Universities of Leicester and Warwick reported some of the oldest known conserved non-coding DNA elements (CNEs) yet described in the animal kingdom, dating back an extraordinary 700 million years. The researchers performed a comparative analysis of 13 highly diverged insect genomes and found 322 CNEs. Given that these species diverged from their common ancestor around 118 million years ago, these CNEs have been conserved for at least this long. Two of these CNEs were found to be conserved in a variety of more distantly related animals, including vertebrates, invertebrates and even jellyfish. These CNEs are thus likely around 700 million years old, having first appeared at the very dawn of animal evolution. 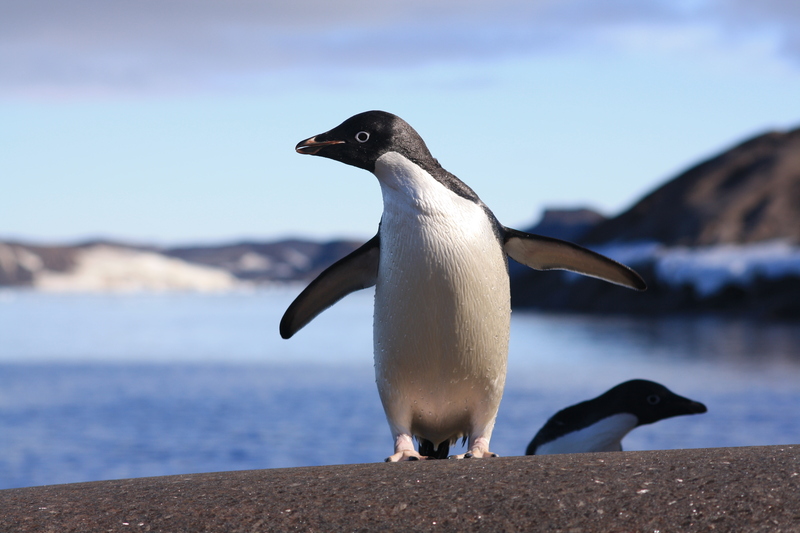 How has climate change affected the Adélie penguin? The detrimental effects of climate change have been uppermost in our minds throughout 2015. However, for Adélie penguins, a warming planet could be beneficial. This study of long term population trends found that at the end of the last ice age, 20,000 years ago, the penguin population in east Antarctica was very small. As the ice sheets shrank, creating more areas of open water where penguins can hunt, the population grew rapidly. It is thus possible that as climate change causes the ice sheets to shrink further, this will benefit the penguins; although, as the researchers caution, this will depend on the effects of climate change (not to mention overfishing) on the penguin’s prey species. Lead author Jane Younger discussed the research on our blog. In January, Paul Sesink Clee discussed the potential effects of climate change on chimpanzees, highlighting three linked papers published by his research group. In February, we discussed the mating behaviour of cannibal spiders, in our blog discussing research on ‘Female control of mate plugging in a female-cannibalistic spider’. The history of Aloe vera was the subject of our blog discussing the paper ‘Evolutionary history and leaf succulence as explanations for medicinal use in aloes and the global popularity of Aloe vera’. In June, we discussed how a lizard has adapted to life at high altitudes on the Tibetan plateau, as revealed in the paper ‘Comparative transcriptomic analysis revealed adaptation mechanism of Phrynocephalus erythrurus, the highest altitude Lizard living in the Qinghai-Tibet Plateau’. An evolutionary love affair between plants and hummingbirds was the subject of our blog on the paper ‘The temporal build-up of hummingbird/plant mutualisms in North America and temperate South America’. The link between male nightingales singing skills and their ability as a father was discussed in our blog on the paper ‘Multiple song features are related to paternal effort in common nightingales’. We took a closer look at a creeping, crawling curious animal (including some spectacular images) as we highlighted research on the ‘Muscular anatomy of an entoproct creeping-type larva reveals extraordinary high complexity and potential shared characters with mollusks’. In August, Ben Pitcher discussed his research on the mating calls of fallow bucks, as outlined in his paper ‘Intrasexual selection drives sensitivity to pitch, formants and duration in the competitive calls of fallow bucks’. Jessica Bryant revealed what it’s like to study the world’s rarest ape as she discussed her paper ‘Identifying environmental versus phylogenetic correlates of behavioural ecology in gibbons: implications for conservation management of the world’s rarest ape’. Do elephants ever stop growing? A question answered by Hannah Mumby and Simon Chapman in their guest blog on ‘Distinguishing between determinate and indeterminate growth in a long-lived mammal’. In their guest blog, Jenny Ouyang and Ádám Lendvai discussed how bad weather opened up new opportunities for their research ‘Weathering the storm: parental effort and experimental manipulation of stress hormones predict brood survival’. Do genes make some swans bolder than others, asked Walter Van Dongen in a blog discussing his recent paper ‘Variation at the DRD4 locus is associated with wariness and local site selection in urban black swans’.